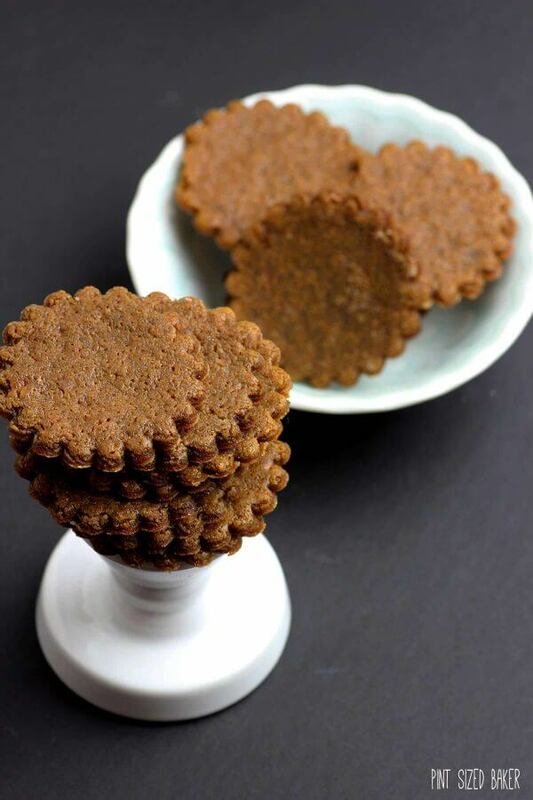 These aren’t your grandma’s ginger snap cookies, oh no, these are so much better. 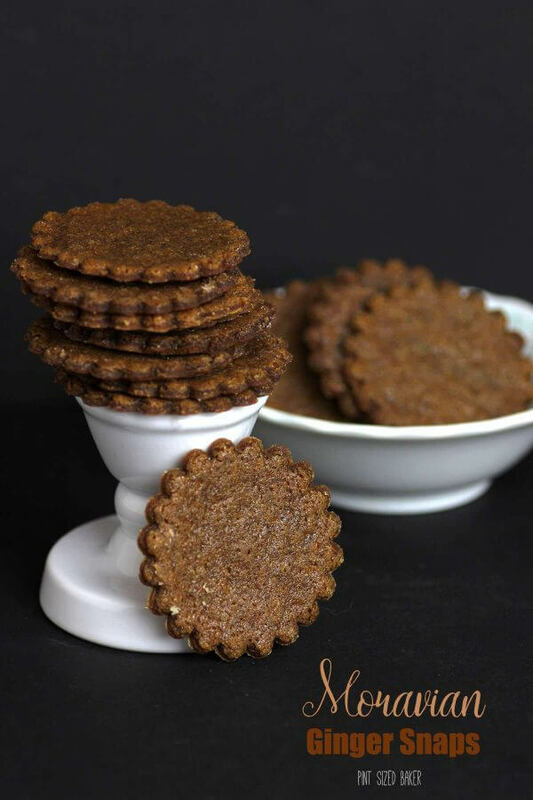 Homemade Moravian Ginger Snap cookies are light and crispy! I’ve got the BEST fall dessert coming this week. It starts off with these easy Moravian Ginger Cookies, then they get used to make a crust for a pumpkin cheesecake and then that gets topped off with candied pepitas, whipped cream, and more ginger snap cookies. I served it at a family gathering and everyone loved it! Who doesn’t love a good ginger snap cookie? I like them soft and pillowy, as well as crunchy. These cookies had a nice snap to edge, but were still chewy in the middle. I enjoyed a few while binge watching Netflix. What’s even better is making little ice cream sandwiches with these Moravian Ginger Snaps. Simply put a small scoop of vanilla ice cream on one and make a sandwich. You can make a bunch and store them in the freezer to enjoy on movie night. Fall is the time for picking apples and pumpkins – it brings fall festivals and hot air balloon rides. Fall ushers in cozy sweaters and fuzzy boots, bon fires and warm blankets. Have you gotten out your fuzzy slippers yet? I have! Do you love fall? I admit, it’s a nice change in pace from summer. I’m enjoying the cooler nights, leaving the windows open, and not sweating while I eat. 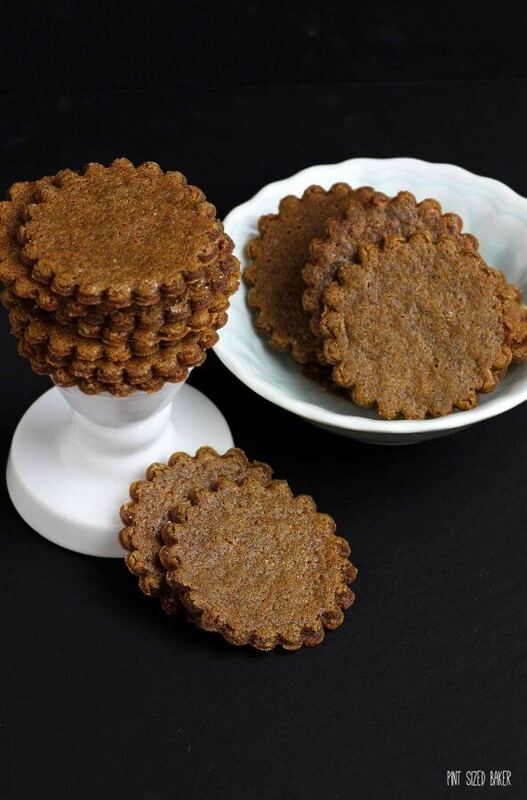 Snack on some yummy Ginger Snap Cookies this fall while snuggled up on the couch in a warm blanket with your family, while everyone enjoys their favorite TV show. Got a love for Ginger? Why not make a Pineapple Punch with Ginger Beer, or bake up a warm and delicious Ginger Peach Crisp. Of course you can also try a Cranberry Ginger Pear Pie for a weekend treat! 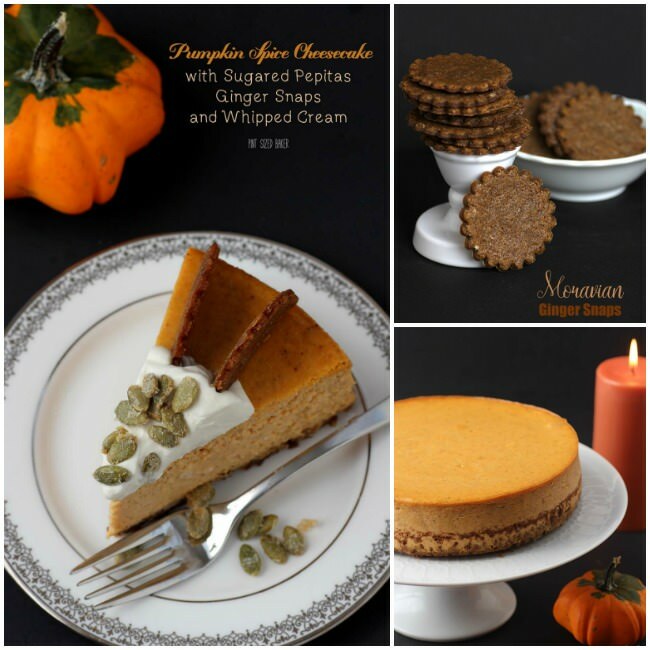 This post is part one of a three part series including an Easy Pumpkin Cheesecake and this Pumpkin Spice Cheesecake. 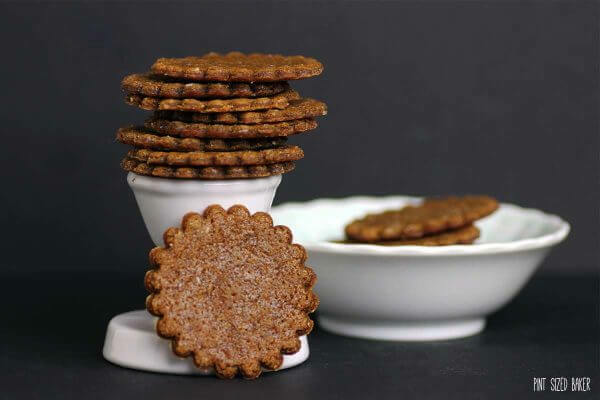 Moravian Ginger Snap Cookies are perfect for fall snacking! Take half the batter and place it on a well flowered surface. Lay a sheet of plastic wrap on top and roll to ⅛ inch thickness. Run a thin spatula under the dough to keep it from sticking, but do not flip the batter over. Cut out 2½ inch to 3 inch sized circles and place them on a cookie sheet lined with parchment or silicone. Place the cookie sheet into the freezer for at least 15 minutes to reduce mis-shappened cookies. Preheat the oven to 375 and bake for 5 minutes. If the cookies "swell" during baking, recut them fresh out of the oven, saving the scraps for the crust. Let the cookies cool on the baking sheet for 10 minutes before transferring them to a cooling rack. So glad they are allergy friendly. I know that you’ll swap out the flour for a GF mix :). Thanks for pinning! Thanks! They were yummy and easy to make. Do you think substituting coconut oil for the shortening would work out well? I Googled swapping it and it says you can. However, this recipe calls for the shortening because it will hold its shape better. Shortening has a higher melting point compared to butter and coconut oil. Also, it will add a coconut flavor to the cookies. I don’t think that I would swap it out. There are “better” shortening options besides Crisco. Look for Spectrum brand shortening. These look fantastic. I’m wanting to make these to go along with a pumpkin dip that I’m making for Thanksgiving. How long can these be made in advance? Are they freezable? Totally freezable. You can freeze the dough or the baked cookies. The best way is to lay the baked cookies out, then cover with parchment or wax paper, then add another layer of cookies. I hope you liked them!